One of my short films, Werewolf Trouble, has had a fortunate run at a dozen film festivals and I’ve been able to attend most of them. I knew the Williamstown Film Festival was different the moment I received my acceptance. Having grown accustomed to carbon copied e-mails, I was mildly shocked when the good news came in the form of a phone call from Executive Director Steve Lawson. When Steve also offered me lodging, I thought he had momentarily confused me with one of WFF’s celebrity guests, like James Ivory or Barry Levinson. The fun started with a resplendent autumn drive along the Mohawk Trail as I headed west through the Berkshires from Boston. I arrived in Williamstown to find my room waiting and food served at a cocktail party before a screening of La Nave De Los Monstrous (The Ship of Monsters), a campy sci-fi feature accompanied by a live original score by the string quartet, Ethel. The after-party was held in the lobby of the Mass Moca where I enjoyed a conversation with one of Ethel’s violinists, Mary Rowell. As the party advanced on the wee hours, I wondered if anyone would wake up in time for my screening at 10:00 the next morning. But the “All-Shorts” session at Images Cinema was packed. Before the movies started I had a pleasant conversation with Tom Fontana, writer/producer of Oz and Homicide, and member of WFF’s board of directors. An eclectic selection of ten movies was shown and the audience ranked their favorites. I crossed my fingers in hopes that Werewolf Trouble would not be screened immediately after Bill Plympton’s weird and hilarious, Hot Dog. I’ve been a fan of Plympton’s since his first animated short, Your Face (1988 Oscar contender). 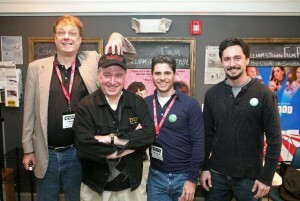 WFF surprised me again when I found myself sitting next to Plympton during the Q&A after our screening. Bill was well-spoken and genuine, and he stood in Images’ lobby personalizing drawings of his hero dog for anyone who waited in line. Director James Ivory (The Remains of the Day, Howard’s End) was the honored guest at a lunch seminar that afternoon. I won’t forget one of his stories: during a break from filming Mr. and Mrs. Bridge, James took a drive with Paul Newman as an evening snow dusted the streets. Fatigued from the shoot, Ivory fell asleep in the passenger seat during a lull in the conversation about Newman’s character. The star continued cruising and thinking as his director dozed. Eventually James woke to the sound of Newman singing. For a fleeting moment he felt like he was in his own movie—as though he were young Douglas Bridge and Newman his father. We spend so much energy as filmmakers trying to turn dreams into reality that unique anecdotes like this really stand out, when reality becomes the dream and those enigmatic creative forces we are always playing with gently push back like childhood friends. I met Bill Plympton again at a cocktail party hosted by Bill Wagner, president of Williams College. Delighted to raise a glass with an artist I admire, I mentioned that I’m also a film instructor at Boston University and asked Plympton what advice he would offer students to inspire creativity. “Look at real life,” he said. “That’s where the interesting stuff is happening.” I couldn’t agree more. Joining the conversation was Alycia Delmore, star of Lynn Shelton’s new feature, Humpday. Alycia’s advice was to first imagine something that would never happen in this world, then imagine the world in which it would happen. I’m also fond of Alycia’s comment because so many effects-happy movies get this backwards—or even worse, just skip the first part entirely. 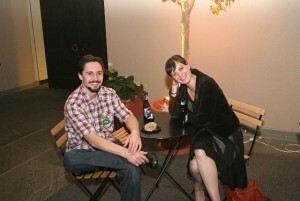 Alycia and I attended the screening of Barry Levinson’s new “film essay,” Poliwood, at The Clark. Levinson (Rain Man, The Natural) answered questions about his treatise on the influence of celebrity culture and television on politics, and accepted an award from WFF: a hand-painted still from the 1998 feature, What Dreams May Come, by celebrated artist Stephen Hannock (also a member of WFF’s board of directors). Delicious Halloween desserts were then served in the Clark Courtyard. The next morning I met Alycia for coffee and we attended a screening of her movie, Humpday. That was another unique experience—sitting in the theater next to an actress I had just met while watching her movie. I was impressed by Alycia’s command of the screen and her insightful comments during the Q&A. Look for Humpday if you like provocative comedies. It’s very well done. I was a little glum leaving Images Cinema for the last time that weekend—sad to leave off new friendships for the time being and to depart Williamstown after such a wonderful weekend. Then Steve Lawson did it again: he offered to treat the remaining filmmakers to lunch. Was he also feeling a bit heavyhearted to see the lights come up on WFF’s eleventh season? I think so. And I’m sure most will agree that kind of commitment to any endeavor is a rare joy to behold. If you made it this far, I hope you will consider getting involved with the Williamstown Film Festival. There simply aren’t enough quality venues where emerging filmmakers can showcase their work and established artists can bring their passion projects. Even less common are events that hold their audiences and lesser-known guests in the same regard as their superstars. Submit your movie if you have one, make a donation if you are able, or plan on attending next season: http://www.williamstownfilmfest.com/. Photos by Roman Iwasiwka. First photo left to right: Bill Plympton, Steve Lawson, Jesse Bernstein, Charlie Anderson; Second photo: Charlie Anderson, Alycia Delmore.